Posted 3 weeks ago , 6 users are following. Sorry all of u i m writing here again. No one dr or cardiologist understanding me. I m laying on sofa from morning to night today. I have pain in my upper chest and in arms. Many time went in hospital emergency and they said i m ok.
Cardiologist did my ct angio and result is unobstructive conarny ateries. I feel my arteries are so much weak. Now today i cannot walk some step still laying or sitting on sofa. Cannot eat any thing because when eat my heart feel strange . it like to arrest or stop. Its cannot bear any stress. Of i speak all feel pressure on heart. Do u think i have anxiety. I dont believe. Because i m in normal and happy mood and pain begain in my heart and chest. I did not eat any thing. Why doctors are waiting i got heart attack. I have no mental or physical stress. Do u think my heart is so weak or i have severe anxiety. Thank you in advance. I m 38 year old. U may right that i have chronic anxiety. Different doctors said different finding. One say i have OCD, one said i have cardiac nuesea. Cardiologist said i have fear of desease. You write simple english but i cannot understand what you said. Actually i m not from english country. I personally feels my heart is so weak do it cannot bear pressure. My echo is 60%. So Sir as u said u cannot walk can not. I m almost every day go to hospitalhospital emergency. I feel my heart is sinking or its going to fail. I have all symptoms of heart patient. But dr said your ct angio is ok. Please suggest me what i do. Thank you so much. Sir what is your age and how you overcome on your disease. Alex u mean when i have pain i tell my mind its not heart issue. But i try it many time. I cannot walk. Dry throat can lays. A waves of strange....in my blood veins in my body like burning or chilling and at last i have to go hospital. Do u think in happy mood this can happend. I hv no stress no tension them why a pain in my chest. Look they have tested your heart and it's ok. If you had a heart problem you would be in hospital and be treated. You have health anxiety like Alex said, and this is what you need to tackle. The mind and body are very interlinked and if you are convinced you are dying then you feel as though you are even when you aren't. Pains in the chest and elsewhere are very common anxiety symptoms. My advice is to seek help for your anxiety. Thanks Hypercat. I thankful to you and respect u. Your english is easy i understand. But some people speak phrase so i cannot understand what they want to say. You said i convinced my mind i m heart patient. I meet many psychologists they give me different medicine. Citslopram is not working i think. My pdychocrist ssid never leave my medicine citalopram. But i hv to go hospital emergency many times and dr change my medicine. Every dr took he feed do he write some thing on paper. As for my heart i have severe pain snd shooting. I become afraid. Then my throat dry. Do u think my mind is playing game with me. i think not. Because i cannot walk . i can not keep ,2 , pillow under my head. My heart start pounding. When i eat something my heart cannot tolarate it. i think cardiologist cannot understand my disease or i m in danger so he dont want to tell me. They took my ct angio and its show disgonosied " unobstructive arteries. " dr said nothing in arteries but i say dr dont want to tell me or they r waiting for my heart attack. Plz tell me what i do. 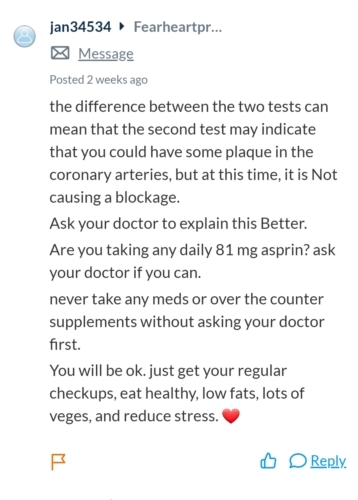 Stop asking and be proactive as I said in your other post, go and get help for your mental issues because if it was your heart you wouldn't be waiting for a heart attack you would have already had it. Alex i m laying now. Shooting pains in the center of the chest arising . its feel heart arteries has problem. How i believe its mental issue. You said you have been many times to ER and you have been told repeatedly your heart is ok. If you won't believe the doctors then you aren't going to believe us either. Whatever tests the doctors do will never be sufficient will they? Even if they go through them all until the end of time you will never believe them. Why not get help for your anxiety and see if the pains lessen or stop? Otherwise you will just lay on your couch until you end up with a heart attack from lack of use. Thanks. Dear my main problem from five years that u write in end. Due to lack of work heart attack. I m telling from five years that when i walk or pick up any weight and then sit or do rest, at that time my heart going to make a problem that i cannot bear. Its take too much time to come back its normal place. Dr told me ur ct angio is fine so no worry. Now they took it again , and diagonoses are unobstructive cronary arteries. So i asked dr they it ok. But i dont believe because five yeay ago report was normal arteries studies. So diffienence in two statement unobstructive and normal. On google there is written non obstructive arteries disease. But my dr said no disease. So how i believe in drs. When we exert ourselves it is natural for our heart rate to increase and it can take some time for it to return to normal. You are worrying about a normal function which shows you have health anxiety. If you stopped worrying about your heart you would worry about something else instead such as cancer. My advice is to stop concentrating and worrying yourself silly about it. Turn your mind outwards instead and just get on with enjoying your life. If you are convinced the doctors have missed something all you can do is ask them to repeat the tests. I can't add anything to what I and others have said to you. It's your life but if you won't listen to advice there is nothing more we can do. Sorry. I m agree with u. All my family members said . i have nothing wrong with my hesrt. But then why i dont walk or do little exercise and stoping. Whu i have shooting psin in chest . why noy dr understand me. Some ppl said me same that u want u become ill. But tell me one thing if my heart is fine. Then when i walk or take bath then why my heart become so much tired. Why i cannot i lift weight. Why my heart become tired. I m 60 kg. Height is 5'8". No exercise oror walk daily in these dsy becsuse of heart. I eat simple food. Vegitable.dont eat any thing that danger to health. Afraid from exercise becsuse when i do rest after my heart start badly sinking. And it take ,3 to 4/,hours to come back in its normal position. Now i go in my street and walk 3 mints. Its feel very hard pressure on heart. Some thing is stopping or closing my throat. Do u think my arteries are now so much weak. Now i am sitting in open air. Its like my heart is stoping. Or it need more oxygen. Very hard time passing. Do u think its anxiety. I do think it anxiety. Its heartheart problem. 5 year ago dr did my EPS to reduce my heart speed. So i dont think i have tracy cardia. But now at this time my condition is so bad. Its feel my heart is not work properly. Very much discomfort my chest. I m weeping. Everybody said i have anxiety but i have heart problem. My arteries cannot getgetting proper oxygen from lung and supply to body. When i walk or little exercise my heart take more time to come back in it normal position. Cardiologist took my CT Angio. From almost 3 year if i walk quick or lift any weight and then rest. My heart sinking and feels its muscels taking much time to become its normal rest mode or place. I feel light heavyness in heart and uper abdomn. I discuss with many cardiologist about this issue. Almost many blood test dr took. 24 hour holter test. Blood tests are normal. Thyroid tests r also normal. But i cannot do jogging or run quick. If i do this its my heart is going to fail. Or it arrest. What do u think am i hv CFS. My heart did not bear any load. Doctors give me most sleeping or resting pills. Please guide me. The second issue is this please tell me what is difference between normal or unobstructive. 5 year ago cardiologist did my ct angio. That was normal. Now i m very much disturb that 5 year ago and now reports are different. 5 year ago all result of ct angio were normal but now results are UNOBSTRUCTIVE. I dont understand medical term. Dr said its normal. But i dont believe hv normal heart as compare to 5 year ago. I request you please tell me or ask from youryour any friend or doctor that why my arteries are unobstructive. I know unobstructive mean is blood is flowing in arteries. But i think a plaque in arteries walls. Please confirmed it from any one. II m on bed now. Can walk . can talk much. Life is ruined. I dont think i have anxiety. You are not listening and this will be my. Last answer until you listen. You are not sick only in your head. The reason your heart races is because your lazy and sit on your bum all day telling yourself your sick. It's a muscle and if you don't use it you will lose it. Your self absorbed nothing else. Sorry u mind it. I know its not blocked. But why then not they write it unobstructive why not write it normal. This is main reason that i asking again and again and disturbing my heart and my mind. 5 year ago all arteries were normal . and now only one is normal others are unobstructive. So this is main reason of my worries. I think unobstructive mean my arteries r narrow but blood is flowing. Therefore i hv problem every day. Thanks sir. I again say sorry to u because i again and again writing. Please tell me how can i make my heart strong by physically and mentally. Because when i exercise little like lift my hands up and down .my heart can not bear this exercise. As for i see psychologist they give me pills for sleep. No effects on my fear. So sir please guide me how i make strong my heart. First off you need to take up a relaxation like yoga so you can learn to breath correctly, just because breathing is an automatic thing and you can't stop yourself breathing doesn't mean we always do it correctly so learning how to breath will help you relax and yoga will help you learn coping strategies. As for exercise you need to start walking at a moderate pace 15 mins 2 times a day and every 7 days add 5 more minutes, this way you will raise the heart rate which is what you do with any body movement, the only way to stop your heart beating faster is to lay down all day and you know that's not healthy. Doing these things will make you stronger both physically and mentally. I am not a doctor so can't confirm anything. 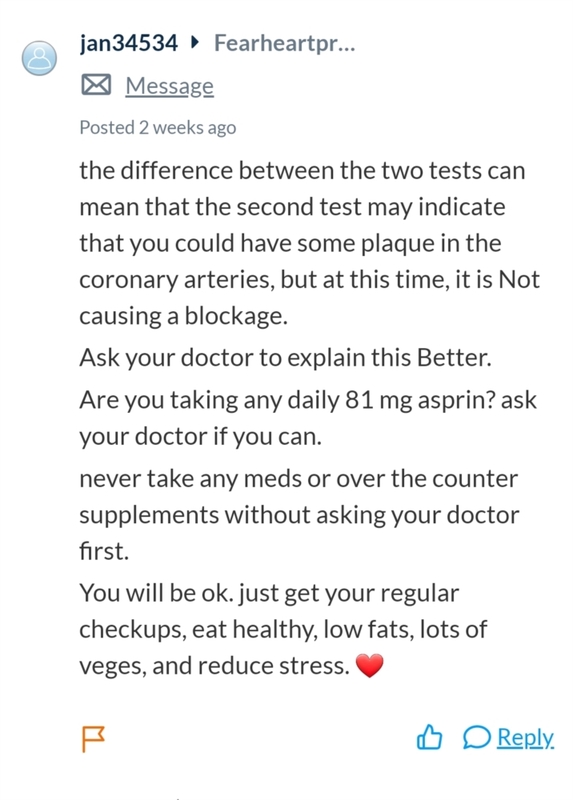 But you have had loads of tests and your doctor has told you that you don't have heart disease. Obstructed means a blockage and unobstructed means the opposite ie you don't have a blockage. Ie your heart is normal. My advice is to get out of your bed and start living your life again. Exercise is the best way to build up your fitness again. You have health anxiety which is very common so seek help for this. Thanks hypercat. I know all these things. I hv to start life. But my main issue is that i am telling to drs that when i lift a load or walk quickly and then take rest it feel my heart is falling and it is stopping. U said unobstructive. I know its mean unblocked. But in the report they write NORMAL before one artery and write UNOBSTRUCTIVE before other arteries. So with alot of sorry and apology my mind is stuck in these two words. Why not they write normal before all arteries. They write one is normal others are unobstructive. I asked it to my dr he said unobstuctive mean is also normal but my mind dont accepting this answer. One dr in usa who told me there is plaque or narrow arteries but blood is flowing so they write unobstructive. I m afraid now how much bad chestrol or plaque in my arteries and if they blocked i will have heart attack. So main problem in my mind is this. Plz u dont mind. If u can clear this point in my mind plz help me out. I m sorry sir. Now i act on your advise. And try to live a healthy life. Try to do little walk. Get up early in the morning. You didn't know anything about the word PLAQUE until someone else mentioned that word. so nice try saying a US doctor told you and if you want I can pull up the post. Here's where you learned the word PLAQUE. No US dr dont told me about plaque. He only told me that your arteries are not normal. Obstructive mean that problem in arteries but blood is flowing still no blockage. So how much problem in arteries drs need angio graphy after two month or when they think its necessery. This all usa dr told me. Hello at this time in my country 10 37 pm. I have pain in teeth from two days. Dr gave me omengtan 625mg, i take it half after dinner. I have traction or tense in heart. I m feeling its vein or artery is going to block. Sever tense in chest. Sir what do u say is it my anxiety or thinking and i have to over look this. Plz advise me. Thanks sir. I m act upon your advise and practice to calm my thoughts. But one problem is there still. Please dont mind it. I feel my heart arteries are so weak because i can not walk because when i do rest or walk my heart badly sinking or dropping and i become afraid. I dont know in which country u live. My arteries are unobstructiveunobstructive. I know its mean unblock. Can you asked please from your doctor or anybody who is medical person what its difference between normal or unobstructive. If u mind i m sorry again. I think in your country doctors may be much more qualified than my country. It was only a matter of time before asked another person to ask their doctor for advice. he did this under another username as well. He either has really bad anxiety or an attention seeking issue. Either way he needs far more help and support then this site can provide. When you said you would stop responding he said he would start taking you're advice and then he slowing starts manipulating again. I don't think he will get help. This has gone on to long. Sir i m watching cricket match . when my favorite team going down on losing side i feel my heart is going to fail. As for my own cardiologist , yeah they r well qualified . but i dont believe on their way of diagonosed or treatment. As for foreigner doctors i want to check them my reports of tests and they can satisify me medically. You know here is summer start . i have only fan no air conditioner. So when sun on peak i feel my heart has big pressure. Is it possible i can talk any well experienced dr of uk on whtsapp or skype. I will pay him his consultancy fee. And i m really thankful to you. They main problem is this i feel presure in my chest. So i m much disturb. I feel pressure in sitting and laying on bed. I so agree and I think he needs psychiatric help to get past this phobia. I am off to support others who actually believe their doctors and even remotely consider our advice to be of any use, we are as honest as we can be and to keep repeating the same things over and over again is so wearing. Sir i have no doubt about your honesty. I m also thankful to you and all people who reply me who encourage me who help me. But in ever hour or in every mint ii feel changings in my body. Hundred of timed i discuss this with doctors that you admit me in hospital and check me throghly. But they dont accept. What i do. I dont know. Sway actually i m living in a developing country. Here is no body understand me. I know i have anxiety but he i have to exmin dr pravitly on my fee or money. Here the psychologist or psychothrepist qualification is low than your country doctors. In your country doctor consontrate on patient . here drs said i hv anxiety but dont know which kind of phobia or anxiety i have. I m tired to go again and again to doctors. So plz dont asume that i m here for any wrong mean. You have health anxiety. I have said this to you several times but you refuse to listen. I am with Alex on this one and am not answering any more. Lay on your bed and be an invalid if you want to, it is your choice. I respect you and alex. I know you r boring from me on my again and again questions. But how can i come out from my bed. Here is summer. When i take breakfast my heart start to sinking or dropping. I feel it is so much weak. I m afraid of walk that when i walk my heart will fail. Do u think my heart has capibility to walk. It's a never ending cycle with him. I wouldn't even bother anymore. He has posted in numerous fourms doing the same exact thing. looking for sympathy and attention. I m trying to walk. Today i take bath but after bath i have to go hospital. It have heavy chest and feeling my heart is not taking proper oxygen. Very bad condition i have from last 3 hour i m on edge. Sweating on forehead. I dont know what i do. I did not eat dinner. Its feel i cannot digest it. My hesrt will stop. I hv feeling burdon on chest. Dont know what i do. But i m really thankful to you all who encourage me who help me. I m really really thankful to you. Well if you are dying from heart problems stay in your bed and don't eat! I guarantee you will die soon, but probably from starvation. But that's obviously what you want so get on with it is my advice. She is not my regular heart doctor. But she is cardiac surgen. She said we are qualified. You need mental treatment. She did not listen me more. She said you r now joke between people but we r doctors we understand you. Alex as i told u here is summer start. I m in my room and due to heat my heart is droping. Do u still say i have mental problem. My heart cannot bear heat. If i eat meal and the heat generate in my body heart also cannot bear it. Its very difficult to spend day for me. Here in my country no doctor listen me in detail. You and other people said me go out from your bed. I did. Please tell how much i walk daily. And what meal i take. Here is now 3 25 pm. And i did took lunch because my heart sinking. Please help me. 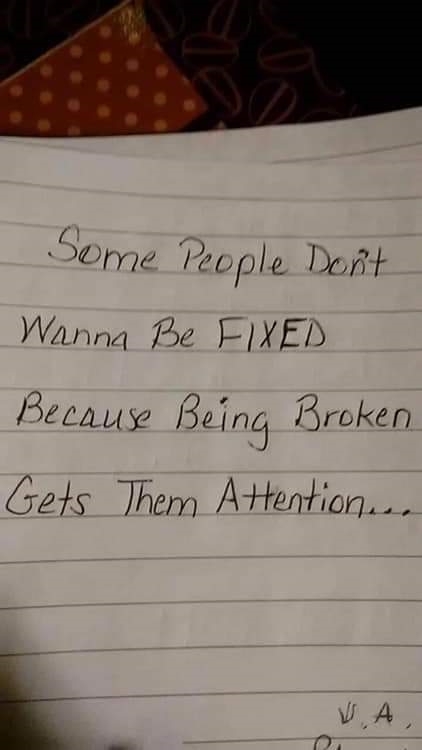 I want to be fixed believe me. But i dont what problem i hv. If i hv anxiety why my heart sink badly. If you're heart was as bad as you say it has been you would be DEAD ALREADY. Get up, go do something , eat healthy and and see a psychiatrist. Because it's nothing but attention seeking behavior. I swear today i again took bath. You know alex bath is not a big exercise or difficult. Now i m again sitting and cannot move. My heart is sinking. I fear i m having heart failure. My body dont taking enough oxygen blood and my heart has difficulty to pump blood. I can not explain in words. Sway i m again in bigbig congession in my chest. I write answer to alex please read that. Sway in simple words my heart dont bear exercise load. Its not anxiety. What i do. No having a bath is not a lot of exercise but neither is sitting /lying around doing nothing, to be honest your NOT listening to anyone even cardiac doctors, your so full of self pity and don't want to be well. My sister has heart failure and angina and doesn't sit around she still lives her life and takes her medication and is fine. The reason for hers is obesity aggravated by diabetes. You sit on hear wasting people's time and effort being kind to you and trying to help you but your not interested. I don't have a problem being harsh. THERE'S NOTHING F.U.C.K.I.N.G WRONG WITH YOU. GET A DAMN LIFE ALREADY. If you want to lay around and pity yourself by all means go ahead. I will no longer respond to you but only warn people of you're pathetic antics. I have spoken to you in you're native language before and you never responded. so don't tell me you don't understand. Good luck. Dear you often said u spoken inin my native language but u write wrong. You write in arabic language but my native language is urdu. Arbic and urdu has large difference. You don't have heart problems as you have been told countless times by medical experts. Anxiety can cause all the problems you are experiencing. With anxiety your heart can beat fast or slow, you can have palpitations, you have sinking feeling and so on. We keep telling you this but you insist you don't have anxiety but heart problems. We have all said it is anxiety to you but carry on believing you have heart problems if you want to. I don't want to hear from you any more so please don't reply. I know i write countless time and you are all irritated and fedup from me. You are all said true according to i told u. But with due respect i have a question and no one answered me yet or cleared me. Big problem is this in my country doctors dont talk in detail. They gave only maximum 5 mint to a patient. So its first of all doctors duty they clear me and tell me in detail. As for you all and some drs said its anxiety but some times my ECG became not normal. Doctors dont tell me detail about it why it is not normal. So some time i have heart symptoms. But you all said its due to anxiety. But i said i dont have any tension i m normal but when i start eating or walk my heart problem start. So always i have this question that how without any tension i have panic attack or anxiety. Again i m thankful all of you. There are no medics on this site to answer that question so you can ask it as many times as you like (and you have), but we can't answer it! Go back to your doctors and ask them. We can't help you with this.